ChemKnits has designed many molecule themed knitting charts over the years. They are spread out over the site, but I wanted to create a summary of all molecule charts provided so you can quickly find the one that you need. Molecule Charts 1 - The post that started it all! Included in this post are the charts for phenylalanine, tyrosine, glucose, histidine, tryptophan, serine, THC, Capsaicin. Amino Acids - All 20 (Natural) Amino Acids charted for your knitting pleasure. Alanine, Arginine, Asparagine, Aspartic Acid, Cysteine, Glutamic Acid, Glutamine, Glycine, Histidine, Isoleucine, Leucine, Lysine, Methionine, Phenylalanine, Proline, Serine, Threonine, Tryptophan, Tyrosine, and Valine. H2O (Water) Molecule Knitting Charts - There are different options for the vibrations. Prophobilinogen and Heme Inspired Charts - In addition to the molecule Prophobilinogen, there are 3 designs inspired by the Heme molecule. Theobromine - the molecule found in chocolate. Is there a molecule you would like charted? Leave me a comment with your suggestion! This is the most amazing collection of charts! My son likes coffee and chemistry - I will be making a Caffeine Coffee Cozy for him. 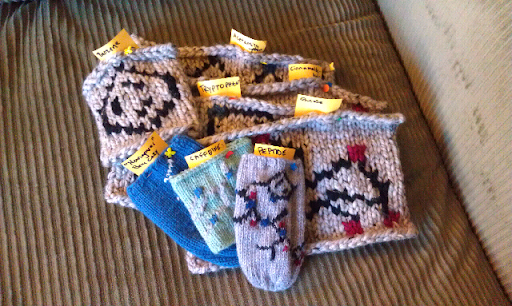 I'm glad to help people knit gifts for other chemistry lovers! I vote for estrogen and testosterone. And oxytocin, though it may be too complicated. It's my favorite. I once once in a classmate's dorm room and I recognized the molecule on a poster. "Why do you have estrogen on your wall?" Serotonin, dopamine and acetylcholine, please! Is this what you mean? http://www.newdruginfo.com/pharmacopeia/usp28/v28230/usp28nf23s0_m80783.htm Tc 99m itself is just an atom, so there wouldn't be much to chart. 6 fold symmetry is difficult with knitting, but I'll see if I can figure something out. Maybe. The molecule (a nonapeptide - 9 amino acids) would be hard to chart because it cyclic and that would be hard to keep flat in a 2D way. I'll keep it in mind for the next time I'm doodling, though! I thought you might appreciate this. My friend's father used to be a chemical engineer (specialising in explosives). When he turned 80, and the family made him a blanket. My contribution was an Octogen molecule, also known as HMX. That is so cute!! Thank you for sharing it with me. Hello! Could you chart a hat or ear warmer with H2O, please? I'm making brain and DNA hats (thanks for the helix patterns!!) for the March for Science, but my brother works with water (making sure schools have access to clean water, among other things), so I'd love to make him one with H2O. Thanks! I'll have to think about a fun way to to water. I leave hydrogens of of most of my molecule knitting charts... I have a few more GENEie versions in the works and then I'll see what I can come up with. Thanks for the suggestion!